a Soup for Syria Supper! Plan the date/time of your event and invite people to attend with at least 1-2 weeks' notice. The location of your event should be something easy for you to manage - your home, place of business, club/organization meetings, and places of worship are all good choices. 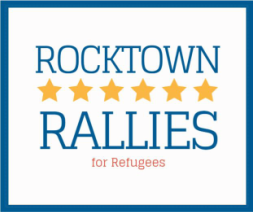 REGISTER your event with Rocktown Rallies so that we know that your event is happening. At the day of the event, be sure to print off some order forms for the cookbook and have a computer/tablet available for people who want to donate directly to UNHCR. Remember the goal is for your guests to buy cookbooks OR donate money to benefit refugees! If possible, track how much money that guests are donating and let us know! Have a good time! Someone from Rocktown Rallies will follow up to find out details like the number of people who actually attended and whether anyone purchased cookbooks and/or made donations. Be sure to take pictures, and let the world know about your party on social media using the hashtags #RocktownRallies and #SoupforSyria.